You’ve just released your album ‘Evacuate’, how’s the feedback been so far? Jay: We’ve been pretty stoked to get the positive feedback that we’ve been receiving. It’s our debut album and the people that have been picking up the album and buying it – the fans, which we massively appreciate and then industry people such as radio stations and all the other’s who’ve picked it up so far, the reviews have been really positive. We’ve also been stoked to get some of the real positive responses, as in the “fresh sound” comments, some of the bands people are saying we sound like and being put in a similar category as some of those bigger bands. To hear those kind of responses is our dream. Now it’s about trying to get it out there more, with more people hearing it. Well, you’ve certainly been getting lots of radio play, you’ve got Emma Scott (formerly of Kerrang!) plugging you and you’re only about halfway through your tour? Mick: Just before the halfway mark with the current dates and hopefully soon some more dates may be added. It’s going well. Are you seeing people coming back to different shows or is it different faces every night? Marco: Random people who happen to be there are looking forward to the next show and are then following us around. Jay: It’s quite awesome when you go to a gig somewhere completely different and whether it’s a small venue or somewhere a little bit bigger, to see some of the same people that you saw in another town, that’s an awesome feeling. It’s amazing; you can’t get a better feeling than that. Those people will grow with you as you get bigger as well … I saw something on Facebook about a South African tour – is that something that may definitely happen? Mick: I’ve been talking to a big booking agent in South Africa and they’re really interested in getting us over there, but we need to make it worth their while, so if we fill up venues or bring 20,000 or 30,000 to a festival. They’re looking for sponsors and we’re promoting and getting our name out there. It’s been a fantastic start, with SA radio exclusives and interviews; in the first two weeks, we got onto to the top 10 most wanted charts in my home town and we stayed there for 5 weeks, only being beaten by Metallica’s ‘Nothing Else Matters’, for two weeks in a row. It’s just been great, from there on we’ve done ‘Breathe’ and ‘The Long Road’ and had a great response, so we’re just waiting for them to get the sponsors ready. We can look at doing it ourselves but we’ve got so many places now – people from America are asking us when we’re going to be over there, and Belgium, The Netherlands – we have radio stations over there playing us every day now. We’re thinking we’ll start with the European market and then take it from there. If the SA tour comes about, we’ll gladly be going. You’re really starting to spread far and wide! Mick: It seems that way, slowly but surely. Yesterday or the day before (on Facebook), I just happened to find these Italians talking about us, saying that we sounded a bit like Stonesour; I’m not friends with them or anything so that was great so we’re starting to see things happening, on twitter it’s also going well. Jay: We’re not doing anything major, nothing on a grand, Wembley stadium scale in the slightest, but it’s just great to feel that people are listening to the music and coming to the shows. So, Wembley, is that the ultimate goal?! Jay: My goal is just to keep on rocking for as long as I can, to be honest. Mick: How far can we take it? If we don’t reach Wembley, it’s not the end of the world. Marco: The amazing thing is that, of course we’re working hard, but doing all of this, we’re still having fun, we’re still enjoying it and people are having a good time with us. Alex: That’s the main factor which drives you to do the gigs, once I’ve stopped having fun, maybe I’ll quit music! Mick: I think the crowd feeds off of our having fun, onstage or off stage. Now that we’ve set up we can relax, have a few beers and it starts now. I’m sure most bands say it, but we are one of the easiest working bands, we haven’t had troubles with anyone along the way. Jay: We like to try and be one of the easiest working bands, just the kind of band that just wants to play, you know? We’re just trying to have a good time. Alex: It’s a really good chemistry. You have people coming to different shows again and again from different places, are these people that have been there since day one? Marco: There are a few that have been there from the beginning, from the first few gigs. Actually the good thing is that they’re trying to spread the word and bringing along more friends and people. Mick: We haven’t got to actually doing it yet, but hopefully by the end of this year or next, as there has been a lot of demand for it, we can hire a coach and bring a lot of our friends and fans to Birmingham. Marco: The first time we played Birmingham there were people coming up from London, travelled by train to see us. They were singing along and wearing tee shirts. Do you find that people bring things to shows for you? Mick: Our last gig was my birthday and there was a lovely birthday card from three of the DJ’s from Rock and Roll Circus and a birthday cake as well. I did have a bit of a worry as I saw James Hetfield get completely destroyed at Sonisphere with cake on his birthday and I thought, where’s this cake going?! Marco: To be honest, we thought about it … but it had candles on it, we didn’t want hot candles burning his face! Taking it right back, how did you settle on the band name? Mick: Originally, it came from Wild Child and it just didn’t go with the way the sound was going. South Africa was very grungy at that time, with Nirvana and Pearl Jam etc. When we changed members in SA, I looked into a Webster’s dictionary and saw ‘feral’ as another name for wild, but I didn’t think Feral Child would go down very well. Then I thought bring SA into it, and everyone kept saying the music had energy so it became Feral Sun. Around that time MySpace was kicking off and the name was one of one – it wasn’t on there already and when I got here, we got the domain name, feralsun.com. The only thing we couldn’t get was Facebook, we lost the name when we changed to a page, so we had to go with Feral Sun Rock. Anyway, it’s an absolute gold mine of a name and people seem to like it from what I’ve heard. When you’re writing, what sort of influences do you draw on? Jay: All four of us bring something different. I’m a metal head, but I’m also a hip-hop, drum ‘n’ bass and dub-step head. Classical music, jazz and funk flavours … I started playing drums because I got given a rock tape, so I was always a rock drummer, rather than going the urban route. My influences are rock-metal, metal to get me the flavours that I need to push to for the next album, drumming-wise, but I still have this automatic urban groove flavour. Alex: For me, I cannot say if I’m driven by jazz influences, rock or nu-metal, for me the main thing is to look at the song as a listener. It doesn’t matter if I play it or not, but I just want to stand outside and listen to it and see if it needs to be changed and it doesn’t matter what kind of influences, the main thing is that the product is a song to be delivered to the people and they accept it. Marco: We’re all from different countries but we’re all into rock. Coming from different backgrounds we pull all of that into the music itself, a bit of everywhere. As a guitar player I always aim for the big guitar heroes, but I listen to classical music, more rock. But I think it’s the way we bring that to the band that makes the difference, not what we listen to. Mick: Everybody is influenced by somebody. Definitely all the 90’s grunge bands, everyone from the Pixies all the way through to Soundgarden and Alice In Chains. Nowadays I’m into Karnivool, Trivium, Killswitch Engage – at the end of the day, you take your influences, then you try and write something that is Feral Sun. Nobody can pinpoint us to one band, which is great. If one person says a song sounds like Stonesour and someone else says it sounds like Soundgarden, to me that’s like, wow, you are comparing us to massive bands. Everyone needs to compare a new band the first time they listen to them, because it’s something familiar to them. Alex: Sometimes when we write new songs, somebody will get the idea which sounds great but then it turns out that somebody else already used a similar melody or rhythm and we don’t want to copy anyone, we just want to be an original band. Marco: It’s very complicated nowadays, there are so many bands! Mick: It’s finding the recipe between something that we’re happy to play on stage and also something that the crowd is going to enjoy. If you could play with any band, alive or dead, current or past, who would it be and why? Marco: My biggest dream would be to share the stage with Dream Theater. I don’t think that would happen as we’re so different, but they’re my favourite band. Alex: I’m going to be unoriginal but I would love to play with Metallica, just to say to James Hetfield, thank you for my childhood, because that’s what made my childhood, so I’d like to shake his hand and say thank you very much. Mick: This is a tough one. Can I say two, as it would be very close between Soundgarden and Pearl Jam. The two biggest influences vocally in my music career and they’re still going, still writing great tunes. I think we could definitely support both of them quite easily! You’re currently un-signed, do you feel pressure to get a ‘record deal’ as people would understand the term? Jay: I don’t think we feel pressure, I think we’re stoked to have some real hard working band members; Mick carries a lot of the administration side of the band on his shoulders. Everybody in the band is doing their bit, but Mick has been the driving force, specifically during this album, so the last 18 months have been great with a bit of management support and Emma Scott getting involved with us, and the radio stations, getting interviews – none of that would have happened if Mick hadn’t gone out there and searched and contacted these people and got them to check us out. Everyone has done their part and we’ve been productive. We’ve tried to throw a few things at labels, but they need to see that we’re serious about it, so we’ve been trying to get to a level where we’ve got proper management and booking and support, which we have now. We’ve tried to do it in an organic, correct way because in this industry now, unless you’re fortunate enough to be supported by a big [record company] nobody’s got any money anyway. We can only show that we still want it and all we can do is keep our fingers crossed and hope that the right people are in the right place and that we’re playing the right way. That leads on to my next question! Given that rock and metal is allegedly outselling other genres in this country, a lot of people are saying that the industry is dead on its arse and that bands will never make it anyway. What’s your opinion? Marco: There are still good bands out there. Jay: It’s not dead on its arse, it’s just going in a different direction. Mick: I think it’s changed. It is a dog eat dog eat world and if bands are falling off along the way, the ones that really want it and are striving for it will get that spot. It’s not just about who you know now and bands have to show they can do it for themselves. We’re lucky that we own everything that we’ve done, but there will come a point where, unless we have a sponsor, to actually get it to the level that we want to go to, that’s where labels with money come aboard. We know the dangers of going that way but that’s what it is. Jay: If it does come to us it would be awesome, but it has to be the right opportunity. Jay: People do still buy CD’s. There are still big chains, HMV are still there and there are still independent shops. Mick: Vinyl is coming back, I went to HMV a week ago and there was Trivium and Bullet For My Valentine on vinyl. It’s on its way back but in a smaller, on demand market. We would definitely look into that, maybe start with 10 and see if people go for it. What about the pledge route? Might you consider that? Mick: It probably is in the pipeline. We funded this album, which wasn’t cheap, but we were happy to do it because we love doing it and it was the only way we could do it. Some days have been 12-16 hours solid work, day in day out. If it wasn’t for these guys, I wouldn’t be sitting here now and we’ve done all that hard work and I can breathe again now. If we can get on to something like this then hopefully a lot of that will be taken off my shoulders and I can get back to doing what I love doing most – writing and playing music. What tunes are you listening to when you’re travelling? Jay: We make mix CD’s, but we’re always adding stuff. Mick: I think we should add ‘Heart of A Coward’, another London-based band. Jay: Sometimes we’ll put on some dance music just to get out of the metal and have something different on a long journey. You’re playing Nuke-Fest in Hull on 12th July? Any other festivals or summer appearances? Jay: If all goes to plan during the next few days, hopefully we may have some more bookings soon. Mick: With festivals, bands need to be on labels, so that’s a massive wall for us to climb and most of the bands will have had to have a release out, so we just missed it. We’re tighter as a band now and there’s a whole lot of things that have been in the background that yes, we’re ready now, but we’ll be a whole lot more ready next year. We’ll be looking out for you at all the big festivals next year then! Anything else to say? Jay: Thank you very much for reading this – if you’ve heard the album and you like it, we massively appreciate it! 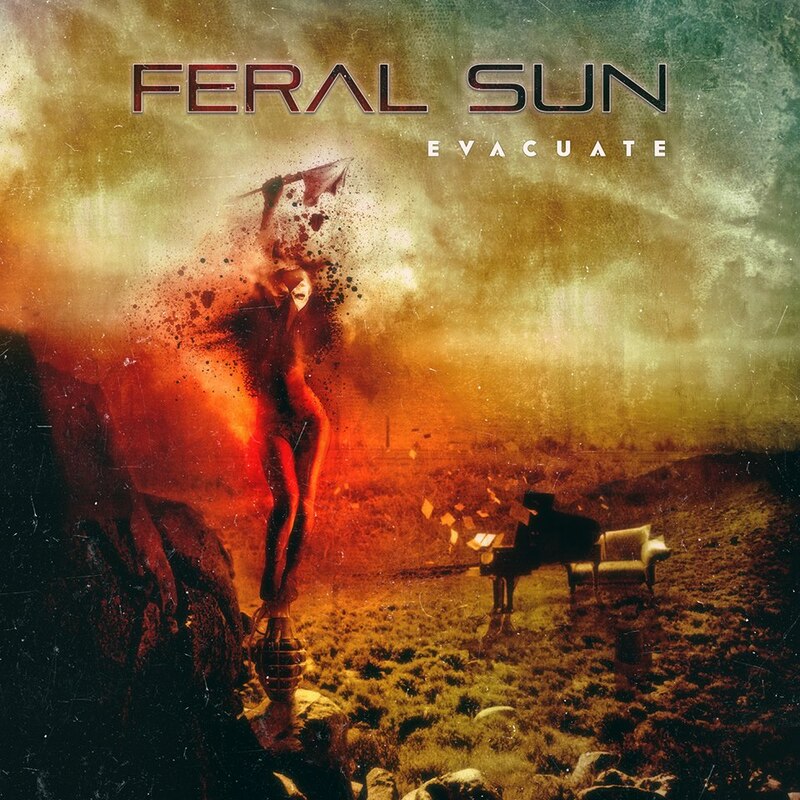 Feral Sun’s debut album, ‘Evacuate’ is out now and available to buy from their website or from iTunes. 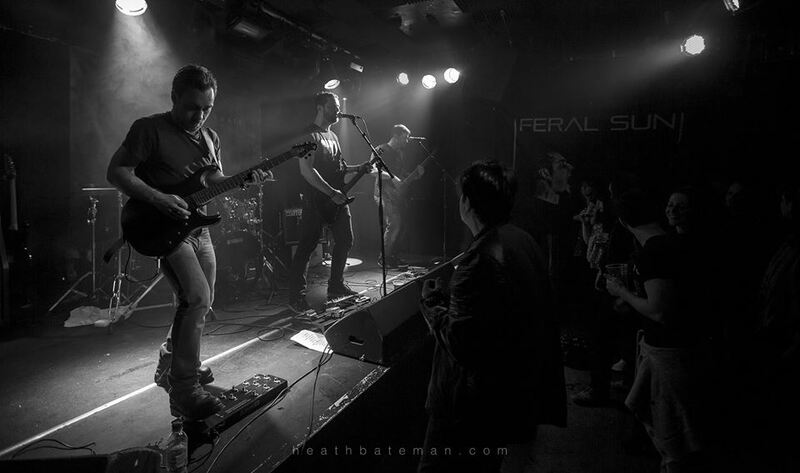 Check out their Facebook page for more gig dates – you seriously need to catch these guys live!